Discussions Magazine Music Blog: THE GRAHAMS: An exclusive interview! THE GRAHAMS: An exclusive interview! When best friends form a band, the chances of their friendship surviving the endless, grueling write/record/tour cycle are slim. When a married couple enters the rock ’n’ roll fray, their chances are even worse. However, Doug and Alyssa Graham – the husband/wife duo who make up The Grahams – have defied the odds. They’ve been friends since they were kids – she was seven and he was nine when they first met – and have been soul mates ever since. Their inspirational relationship aside, they both share a passion to create music that connects with the listener. While Alyssa has recorded under her own name in the past (with Doug ever present), they are equal partners in The Grahams. Their strengths are each other. Thankfully, they share their passion for life, love and music in their songs. 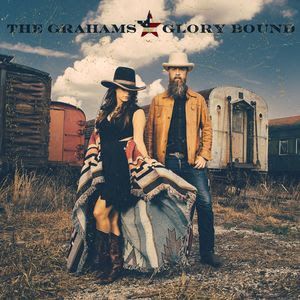 Some call The Grahams Americana while others are content to label them a Folk or Country band. No matter what genre you prefer to file them under, there’s no denying that The Grahams are dedicated to their craft. When recording their 2013 debut album Riverman’s Daughter, the duo traveled the Mississippi’s Great River Road to find inspiration for the album’s songs. 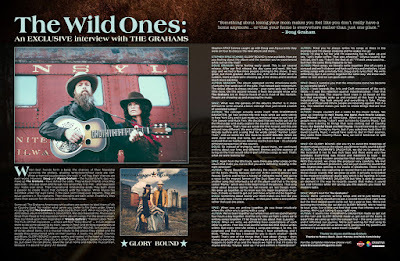 For the second album, they stumbled upon their inspiration in Woody Guthrie’s “Farmer Labor Train.” The fruits of that inspiration — a track entitled “Glory Bound” — in turn inspired them to do some exploring by train, taking in fresh and thrilling experiences at every stop. While their 2015 album, also called Glory Bound, isn’t a collection of songs about trains, it is a musical tribute to the places they visited and the people they encountered while on their journey. A lovely mix of Folk, Country and Blues, Glory Bound is warm, earthy and rooted in the heart of America. Whether you are from a big city or a small town, the album speaks to everyone. So, put down the cell phone, leave the car at home and ride this musical train, because it is bound for glory! All aboard! STEPHEN SPAZ SCHNEE: Glory Bound is now available. How are you feeling about the album and the reaction you’ve experienced while out on the road? DOUG GRAHAM: We’re feeling really good. This is our second release. After our first release, the day came and went. We had gigs and we had a few more people coming to the shows. It was great, but more gradual. With this one, it hit with a POW! All of a sudden, more people were showing up at the shows and it seemed much more exciting. 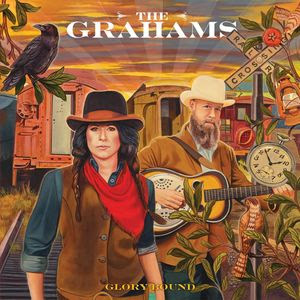 ALYSSA GRAHAM: The album appeared on the Americana radio charts the first week out of the gate. That helped gain momentum. The debut album is always exciting – your name gets out there a little more. On this second release, it feels like people know who The Grahams are or they’ve heard of us in most of the markets. People are showing up and enjoying the music. SPAZ: What was the genesis of the album’s theme? Is it more difficult to write around a basic concept than just record a batch of unrelated songs? ALYSSA: The concept actually wrote itself. With Riverman’s Daughter, we had written the title track while we were sitting in New York City and it just made us reminisce back to our love of Tom Sawyer and Huck Finn. We decided that we had to get out to the Mississippi and really explore the sounds and cultures that are prevalent there. That’s how we wrote the first record, and this one was not very different. We were sitting in Nashville, obsessing over Woody Guthrie and a song that he wrote called “Farmer Labor Train,” and we wrote the title track to Glory Bound. When we were done writing that song, we just looked at each other and realized that we had to see America via the train now – it’s a totally different perspective of the country. DOUG: So instead of trying to write about trains, we continued writing about our lives and different themes and the essence of living on the train would inform part of these songs as well. That’s what we were looking for. SPAZ: Apart from the title track, were there any other songs on the album that made you realize that you were definitely heading in the right direction? ALYSSA: “Glory Bound” was definitely the reason for us getting on the trains. Mostly because our icon in this writing process was Woody Guthrie and he has a history of riding the trains and giving a voice to the migrant farmers of the Dust Bowl era. But there is another song that informed a lot of the album and that is the song called “Mama,” which was in the beginning of the process. That song came about because during the last record, we lost Doug’s mom. We grew up together, so his mom was this major inspiration in our lives. It made us need to get out and move around and be together. DOUG: Something about losing your mom makes you feel like you don’t really have a home anymore… or that your home is everywhere rather than just one place. SPAZ: When you are writing together, do you know intuitively where the other one is going with a song? ALYSSA: Mind you he always writes his songs at three in the morning and I’m always sleeping and he wakes me up! DOUG: I’ll play it for her and I’m expecting her to wake up and say, “Let’s make coffee. That was amazing!” (Alyssa laughs) But instead, she’ll say, “I don’t like that at all.” I’ll walk away pouting…but then the same thing happens to her. ALYSSA: Most songs, we literally write together. One of us gets a concept and we’ll sit down and hash out lyrics and melodies. I start writing songs with a melody first. Doug starts lyrics first. We write differently, but it all comes together the same way. We know each other so well and we can push each other. SPAZ: Does it surprise you that the Americana scene has become so successful lately? DOUG: I look towards the Arts and Craft movement of the early 1900s – it was this rebellion against industrialization. I feel that is happening now. The organic food craze is all based on the fact that everybody woke up and realized all this food is being industrialized. You look around and everything is fake. Things seem so artificial and I think people are rebelling against that in a way. The rebellion makes you want to create things that are true and real. ALYSSA: People couldn’t put a name to the music before. We grew up listening to Neil Young, the Band, Pure Prairie League, Joni Mitchell – that’s all Americana. When we were growing up, people were saying, “I don’t want to listen to Country Music,” but they were listening to things that were coming out of Country Music like Grateful Dead and Neil Young. I loved listening to Linda Ronstadt and Emmylou Harris, but if you asked me back then if I loved Country Music, I would have said no. But in their essence, they come from Country Music. Now, we call it American to split the difference. SPAZ: On Glory Bound, did you try to avoid the trappings of modern production so the album would never really sound dated? ALYSSA: On Riverman’s Daughter, we did try to avoid that. We recorded it live to two inch tape and there were very few overdubs. Everything was mixed and mastered to tape – we wanted to avoid modern production that would date the album. With this record, we chose the producer very carefully. We met with a lot of different producers, and we just loved the sound that Wes Sharon was getting in his studio in Oklahoma. There is this sound that Wes was capturing on record that is so reminiscent of those classic sounds that we grew up with. It actually is recorded in the modern traditional studio way which is by layering. It is not like we did Riverman’s Daughter but Wes is able to capture an element in the way he records sounds that makes it sound live and timeless while still giving you the aspects you need for modern radio. SPAZ: What’s next for The Grahams? DOUG: We’re currently writing songs and we’re just taking our time. It was really important to get a second record out right away but the third record won’t come out for a year or two. We’re not pushing the timeline like we did on Glory Bound. We’re hoping to tour, write, live a little and find that song that informs our next journey. We’re just taking it easy right now.